The man in black fled across the desert, and the backpacker followed. His silhouette roosted on the ridge that separated the climb on the west side from the broken land below the South Rim. It is a dry, disturbed land, periodically remodeled by a god that couldn't leave well enough alone, and then finally neglected. The silhouette shouldered its pack, and disappeared over the ridge. It was a dry year in Texas. The landscape was the color of no-color. Even the dust had withered and died. The plants had become ghosts. The flop ears of prickly pears lay in crumbling heaps. Sotol stalks lay collapsed on the ground like failed hopes. Ocotillos still raised their strange arms skyward, but their waxy green flesh had faded, revealing a skeletal gray matrix beneath. Maybe the next rain would reanimate all their sorry carcasses. Maybe not. Maybe they would continue crumbling and new shoots would resume the cycle of life. Who knows? 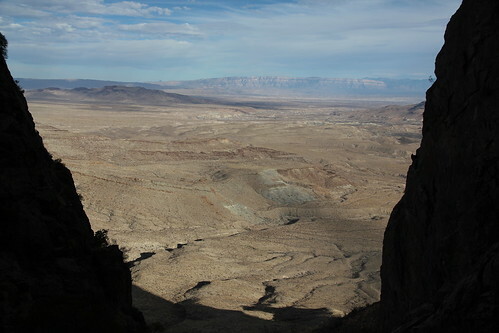 In the Big Bend the border between life and death is as illusory as the border between nations. Up and up. I followed the dusty trail, noting tracks that I recognized. At the ridge I stopped, planted a foot firmly in the dirt, lifted. Aha—the same track. What did it mean? I shouldered my pack, and disappeared over the ridge. The path switched back and down and east. Past the old corral. Past the junction of Smoky Creek. Past a skeleton line of fence posts. Through the mesquite and sandy washes. Through forests of sotols and snow banks of dry bunch grass. The path rolled on, a remnant of a communication link between ranches in the old days. Black shirt, black pants, black pack—the man in black sat on his throne, surveying the next long fall of the land. Round glasses, thin shaggy goatee. He sat calmly, absorbing the waves of the land beyond. I hailed him: "Nice boots." 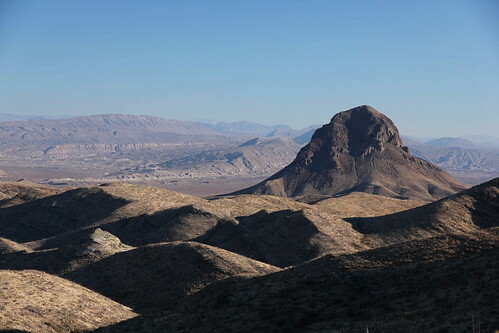 Every other aspect of the Big Bend Country—landscape, configuration, rocks, and vegetation—is weird and strange and of a type unfamiliar to the inhabitants of civilized lands. The surface is a peculiar combination of desert plain and volcanic hills and mountains, the proportions of which are increased by the vast distance which the vision here reaches through the crystalline atmosphere. There is no natural feature that can be described in familiar words. —Robert T. Hill. "Running the Cañons of the Rio Grande." 1901. Collected in God's Country or Devil's Playground: An Anthology of Nature Writing from the Big Bend of Texas. I met the man in black again later that evening at the junction of the Dodson Trail and Fresno Canyon. His name was G—. He worked in lawn care in Maryland. In the slow winter season he would lay himself off for a few weeks, ignite the truck, and point it at the western deserts. Somewhere. Anywhere. 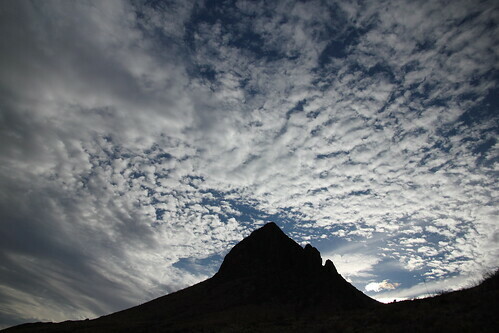 This week it was Big Bend. Next week it was Anza Borrego. G was fretting his water supply. So was I. You can walk for days and days out there—as long as you have water. The rangers recommend four liters (about a gallon) per day. I packed four liters total for three days. I had two liters remaining. 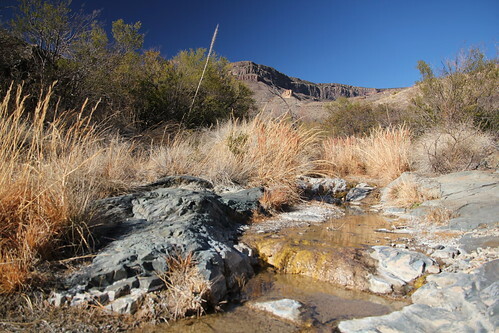 The flow at Fresno Creek would be the difference between slinking back to the trailhead or climbing Elephant Tusk in the morning. Fortunately, even in a drought year, Fresno Creek pushes briefly above the surface, trickling and pooling, before disappearing back into the sand. I took one of G's bottles, wandered down canyon to stock us both with water. Before I left for the evening G asked where I was going the next day. To the top of the Tusk, I said. He said wasn't sure that it was possible to get up there. I had my own doubts in the morning. I could see Elephant Tusk looming, backlit in the southern sun. It did appear more vertical than I had imagined. In the golden glow of the South Rim, under the head of the Tortuga, I packed a dummy bag for the hike and started walking. Let possible work itself out. The path first skirted and then dove into the canyon, weaving its way uncertainly toward the river. I wasn't going that far. Elephant Tusk loomed mean and dark, a strange Triassic tooth emerging from a mound of its own debris. Except in the shadows of the narrowest canyon walls, the Tusk remained always in sight. Just below the three cottonwoods of Elegant Spring, I left the trail and started up the base of the Tusk, weaving among the defensive desert plants. 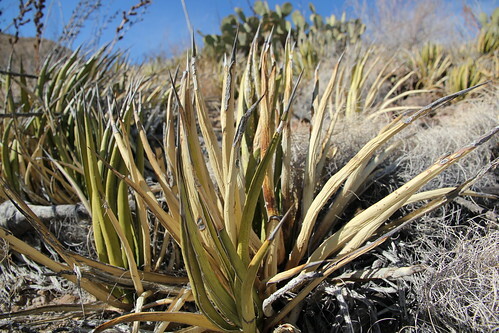 Allow me to save you some trouble and a pint of blood: do not touch the lechuguilla. Don't even scrape it. The leaves look yellow and dry and impotent, like corn husks. This is a trick. A few times I walked too close and had to pause, remove their knife tips from my pants and the shin underneath. The last time I touched a lechuguilla I didn't have to inspect the wound closely. I lifted my pant leg to remove the leaf tip from my calf muscle and a mess of blood plopped out onto the rocks. I accepted this diagnosis at face value, and resumed climbing. I followed the ridgeline to where the slope met the wall. Which way to go up from here? Which fissure led to the top? It was obvious from the bottom, looking up, but here every fissure appeared to be the correct approach. Walk around the wall until the scene looked right. Piles and piles of rock plate talus had been spewed from the wall and now lay in a treacherous cascade at the steepest angle in which they could rest. Any steeper and down they go. Any extra force applied to the rocks and down they go. Two steps forward, three steps back. I clambered up the main fissure, talus scraping and clinking a hollow echo as the walls drew together. The fissure funneled to the width of a thorn bush. A toll gate. Pay in blood. I put my shoulder into the bush, the bush put itself into my shoulder, and I heaved through. Into a wall. I'm no climber, but I do what I have to do to get up. Up. Fifteen, twenty feet up the chute, up. Top out. Look. There was much more up remaining. There was no clear route to the top, just a mess of ill-fitted vertical terraces of rotten rock and gravel. Squint up at what was surely a false summit hiding more up beyond. The wind was a low hush. The world cleaved neatly into two parts. There was up, and there was down. There was no audience. There was no winning and no losing. No medals. No badges. No achievements. No discovery. No journey into the unknown. Go up and come down, and then it's just a memory, until you die, and then it's not even a memory anymore. Stand there, steeping in self-doubt, wondering why a person is propelled out and up, and if it might not be better for all involved to go back now. I put my hands on the rock above, dug a toe into a crack, and stepped up. And stepped up. And stepped up. And on and on until there was no more up that wasn't sky. I searched the summit for a why, but couldn't find any. Maybe there is no why. Maybe the strange music leads to unexpected places for no reason at all. Clouds floated in from the southwest. The afternoon unfurled like the land below, on and on, a long slope of wrinkled ground to the Río. But there was an end to the afternoon like there was an end to the land, and it was best to start moving. I'm no climber, but I do what I have to do to get down. 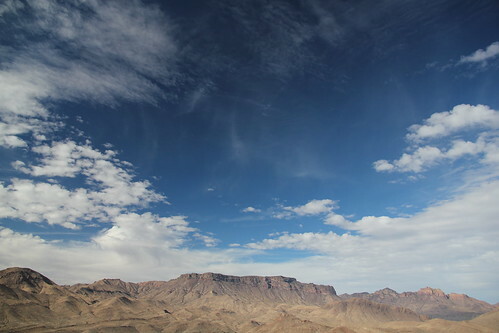 This entry was posted in Travel and tagged Big Bend National Park, Elephant Tusk, Texas on 2012-02-21 by kirk.kittell.